Leading Edge Group develops a natural bond with leaders focusing on business transformation. We grow as your organization grows and improve performance by providing customized services that deliver measurable results. We work with you every step of the way to realize your organization’s true potential because we care about your people, your culture and your customer. We care about passing the benefits of our experience to you, as an individual, an SME or a large corporate or healthcare organization. Striving for perfection underlies all that we do and we will provide you with the platform to develop a Continuous Improvement culture and sustain it in your everyday work. We use a combination of data based process change and positive cultural change to improve performance and help your organization grow. Leading Edge Group was established in 1995 in Cork, Ireland by our CEO Joe Aherne. We have continued to grow and expand with operations in Canada, Australia and the Middle East. Joe established the business when he realized that positive change is achieved by going back to the very basics – the people. Leading Edge Group was established to help the real experts – every manager, every operator, every administrator, every clinician, every CEO. With our experience, we act as a lever for change to allow you to realize your organization’s true potential. 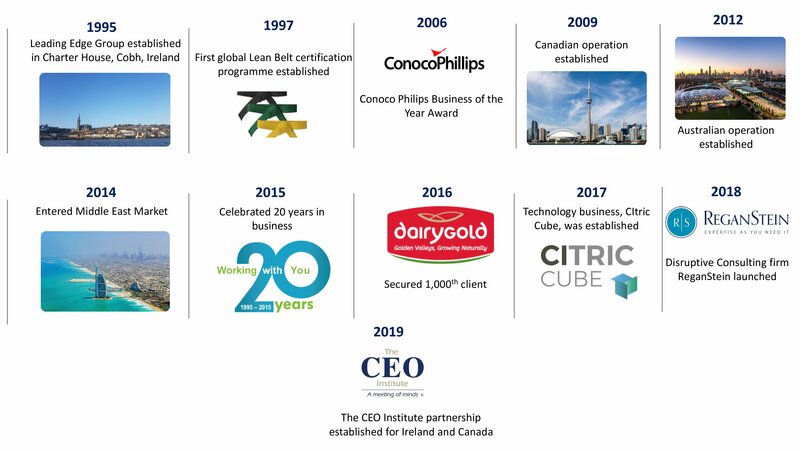 In over 24 years, we have worked with more than 1,000 satisfied clients to deliver anything from full organization-wide transformations, rapid improvement events to customized training solutions, all of which have created over $1B in improvement savings.